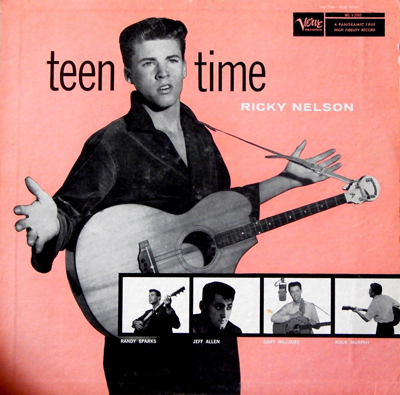 TEEN TIME – A SAMPLER ALBUM released by MGM-Verve Records in 1957, featured the recording debuts of several music-biz newcomers including: Hollywood’s Ricky “Teenage Idol” Nelson, Oakland’s Randy “Green, Green” Sparks, and Spokane, Washington’s very own Gary “Travelin’ Blues Boy” Williams. Nelson, of course, went on to become a major TV star, pop singer – and, well, a teen idol – while Sparks resurfaced later as the folkie founder of the New Christy Minstrels, and Williams went on to a long and interesting career in country and gospel music. Born and raised in Spokane, Williams was inspired early on by his old 78 rpm records of America’s “Blue Yodeler,” Jimmie Rodgers. In 1949, at age 11, Williams received a guitar for Christmas and by ’53 he was performing live on KXOI, the town’s first television station. The Union Oil Co. began sponsoring his radio show on KSPO the following year. Soon he was also appearing on the local cowboy TV show, Saddle Up With Slim. Later in ’54 Williams decided to attend the second annual Jimmie Rodgers Memorial Celebration in Meridian, Mississippi. Travelin’ cross-country to the event, Williams was arrested for hitchhiking near Colorado Springs. When the UPI newswire ran a photo of him perched up on the local police chief’s desk strumming his guitar, it made a big splash in the nation’s morning papers. In the end, the lawmen chipped in and bought the kid a bus ticket to complete his journey southward. When he arrived in Meridian, Williams was welcomed as a hero and he performed at the event, as did a pre-fame Elvis Presley. 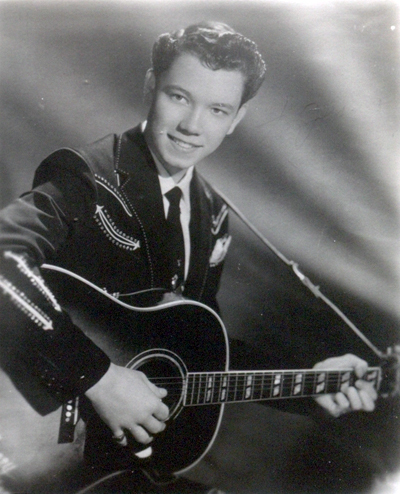 Williams was back in Spokane working several network radio shows when in mid-’55 he was signed to Town hall Party – the west coast’s top country music TV program. He moved to Los Angeles and appeared for several years along with the likes of: Tex Ritter, Lefty Frizzell, the Collins Kids, Johnny Bond, Wanda Jackson, Carl Perkins, and Seattle’s own country star, Bonnie Guitar. Then in ’56 he went to Nashville and guested a few times on Webb Pierce’s ABC-TV show. Williams also performed on the Louisiana Hayride and Red Foley’s Ozark Mountain Jubilee. He returned to Town Hall Party and during the same season sang a few rock ‘n’ roll songs on Screen Gem’s daily TV show, Ranch Party.